The human personality is itself a ratha, which is on a yatra from beginningless time. The Katha Upanishad describes the ratha as comprise of the body, sense organs, mind, intellect and the soul. 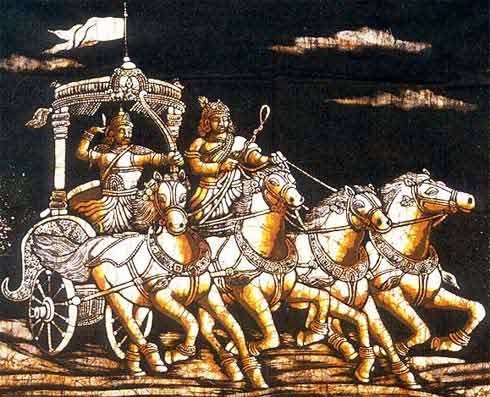 Ratha (chariot) symbolism in Hinduism is mainly found in the Upanishads. The Atman is the master of the chariot, the body is the chariot, intelligence is the charioteer, diversified mind is the reins, sense organs are the horses and sense objects are the roads along which this chariot is driven. But why should the ever perfect and ever free Atman have the need to go anywhere? Lord Yama tells Nachiketa in Katha Upanishad that the journey is made by the Atman when it is conditioned by identification with the ratha. When so conditioned, the Atman is called jivatman. Liberation from this conditioning is the goal of human life. And the journey towards liberation begins when the senses are restrained from traveling towards the sense objects, the mind is made one-pointed, and the intellect is turned inward towards the Atman. This teaching is symbolically present in the famous Rath image of Bhagavad Gita with Krishna, Arjuna and the horses.